1 photograph : b&w ; 25.5 x 20.8 cm. This photograph depicts the commemoration plaques in the Chateau Laurier, Ottawa. On the top of the plaque, there is a circular relief of Brutinel and a relief showing Canadian machine guns on Vimy Ridge. 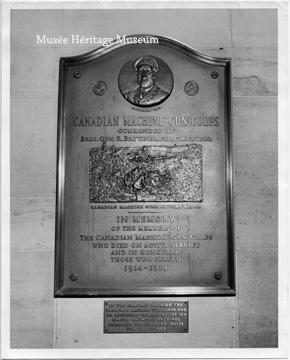 The plaque commemorates the Canadian Machine Gun Corps commanded by Brigadier-General R. Brutinel, C.B., C.M.G., D.S.O., and the memory of the members of the Canadian Machine Gun Corps who died on active service and in honour of those who served 1914-1919. A smaller plaque underneath reads "In the Chateau Laurier, the Canadian Machine Gun Corps had its beginning--Here in August 1914, Major Raymond Brutinel enrolled the first recruits for the Corps."